I originally made the transition to natural and organic beauty products when I was pregnant with my son nine years ago and it was one of the best decisions that I have made for myself and for my entire family. In the beginning, it was extremely difficult and frustrating for me to find good quality natural beauty products but thankfully that has changed with companies like Vasilia! Vasilia is an online beauty boutique that offers the highest quality natural and organic beauty products including offerings for the body, face, hair, bath, baby and even a men’s line. This is a one-stop online shopping experience where you can purchase everything you will need for your beauty care and have it conveniently shipped right to your doorstep. Taking great pride in using only the highest quality naturally derived ingredients that targets a specific beauty need, Vasilia is based in Greece which sources rich olive oils, mastic (prized in the Mediterranean) and natural thermal spring waters. We can feel confident that all of the products are free from potentially harmful chemicals such as parabens, synthetic fragrance, mineral oil, propylene glycol and sodium lauryl sulfate. The Mythos Body Butter ($38) is so rich and luxurious as it is packed with olive oil and soothing Aloe Vera. I love that it has all recognizable ingredients such as Shea butter, almond oil and vitamin E and is amazingly effective at moisturizing my skin. I have very dry skin and love to use this fresh smelling product while my skin is still a touch damp after a shower. It absorbs beautifully with no greasy residue and my skin looks and feels soft and supple to the touch. A very small amount of the product goes a long way so this large 6.7 ounce jar is a great value and perfect for skin that needs extra hydration. I think it would be great for pregnancy or post-pregnancy too since the ingredients may help with skin elasticity. 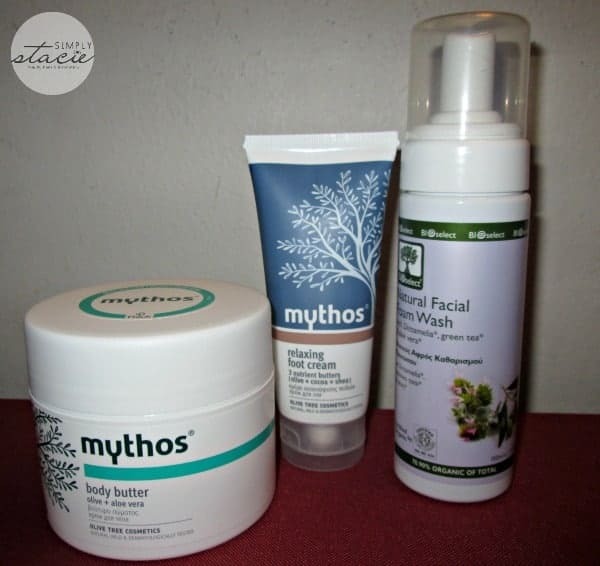 The Mythos Body Butters are available in a variety of natural scents such as Vanilla, Honey, Pomegranate, Green Tea and more. Nothing is more pampering for me than a nice foot rub or pedicure. Since I can’t get to the nail salon as often as I would like I enjoy using products such as the Mythos Relaxing Foot Cream ($33) at home. This nourishing product keeps my tired, rough feet smooth with 3 nutrient butters including olive, cocoa and Shea. It does feel very relaxing as it is noted for “toning of blood circulation” and it feels wonderful during a nice foot rub (thanks, Honey….much appreciated)! The Bioselect Natural Facial Foam Wash ($31.80) is one of the best facial washes that I have ever used and I normally don’t use a foam cleanser! My skin is normally quite dry but after using this product for one week my facial skin is clean, refreshed and hydrated while it effectively removes all of my makeup and my skin never feels taut or dry! It uses the main ingredients Dictamelia, Green Tea Extract and Aloe Vera. I was not familiar with Dictamelia and was impressed to learn that this organic extract of the plant Dictamo when infused with organic olive oil can soothe and protect the skin from inflammation due to its healing anti-microbial properties. That is perfect for my sensitive, often inflamed skin due to dryness and eczema. Overall, I am extremely impressed with the quality and effectiveness of the products that I am currently using from Vasilia. I appreciate that I can order online and receive the highest quality natural and organic products available from the Mediterranean. You are invited to visit Vasilia to browse the entire collection of skincare, beauty care products and hair care products. 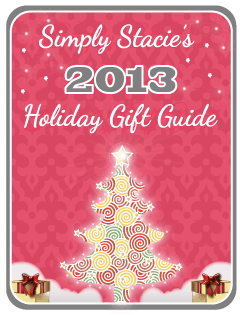 You will be sure to find wonderful gift ideas and be sure to pick up your favorites to treat yourself too! I learned they are an organic company and use all natural ingredients. I would love to try the Bema Emulstion for Lips and Eyes. I learned that mastic restores collagen and elasticity to the skin. I like the Bioplasis Exotic Shower Gel. I would like to try the Bioplasis Tonic Lotion with Green Tea. I like Bioplasis Shower Gel for Body Peeling. I’d like the Bema After Sun Emulsion. I like the Bioselect Pure Olive Oil Soap Anti-age Care With Honey & Myrrh. I would love to try this. I like the Bioplasis Revitalizing Shower Gel! I like the Bioplasis Shampoo for Dyed and Tired Hair. I also like their Bioselect Eucalyptus Natural Essential Oil!